The timing is right for a marketing drive on renovation and refurbishment, advise Golden Coast. To help its customers profit from this often overlooked market, Golden Coast is offering installers the opportunity to benefit from a free, customised brochure that illustrates the way that customers can improve the look, feel and maintenance of their pool. 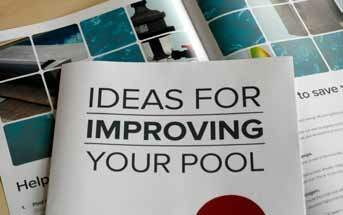 Entitled Ideas and Inspiration for Improving Your Pool, the glossy, full-colour brochure highlights the ways that pools can be more eco-friendly and energy efficient. Golden Coast’s latest market tool has been developed to help pool suppliers take full advantage of the upselling opportunities available. The brochure can be branded – free of charge – with the supplier’s own logo – immediately equipping businesses with professional-looking, customer-facing literature specifically developed to encourage customers to upgrade. “Over the years, we’ve learned that any pool can be improved,” says Golden Coast’s managing director Jamie Adams. “For installers, the need to replace worn or inefficient equipment – together with owners’ desires to enhance their experience through additional or better features – means that pools can continue to be a potential source of income long after installation. “Customers are demanding greener and leaner technologies, so the latest brochure inspires them with products that will reduce their carbon footprint… and the associated running costs,” he adds. The supplier-customised brochure also suggests retrofit ideas which save time and effort on pool maintenance, as well as some which simply add extra fun. Swimming pools can and should continue to be a source of income long after installation, according to Golden Coast, the UK’s leading independent supplier of wet leisure goods to the trade. This initiative is one of many ways in which Golden Coast has been working to support its trade customers’ business and support the wet leisure industry in recent years. “Our success is only wholly dependent on our customers’ success, so we always go the extra mile for our customers – doing everything we can to drive sales and help them grow their businesses,” says Jamie.